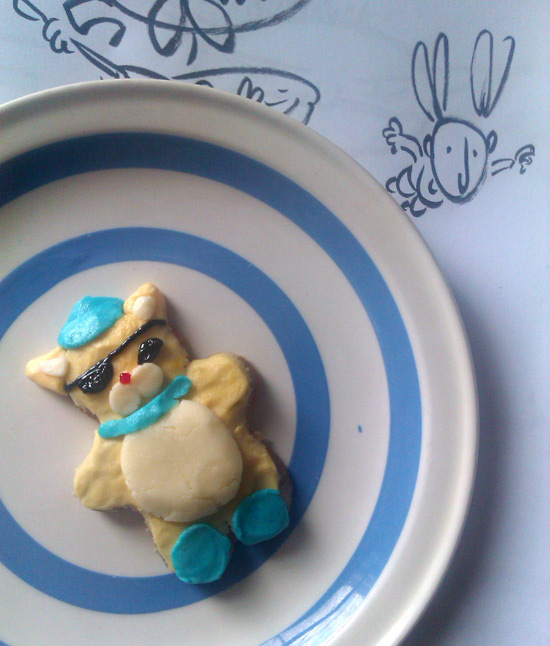 I made some gingerbread men with my daughter this morning, and then, for a bit of a treat, I thought I’d turn one of them into Kwazi from the Octonauts. I hope she likes it! 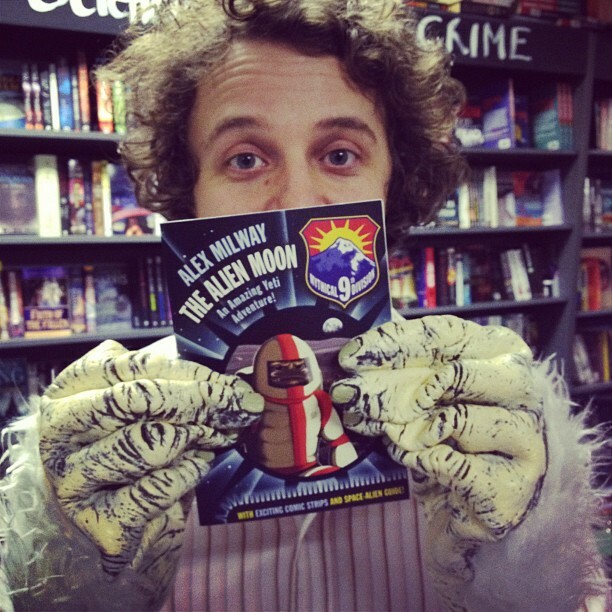 I took a step back from Death’s door, nearing Death’s conservatory, and ventured out to my Alien Moon book launch. 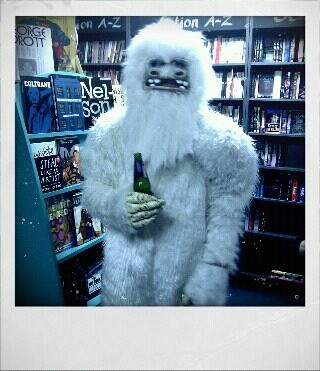 What a great night, and I even got the chance to give my yeti suit an airing. It was hot inside, I hasten to add, and it was a launch party, so a beer was the only option. I think I only managed to scare one child, but that was only a little and he was soon poking me to see that I wasn’t scary. I was, however, asked to manhandle a few guests for photo opportunities. 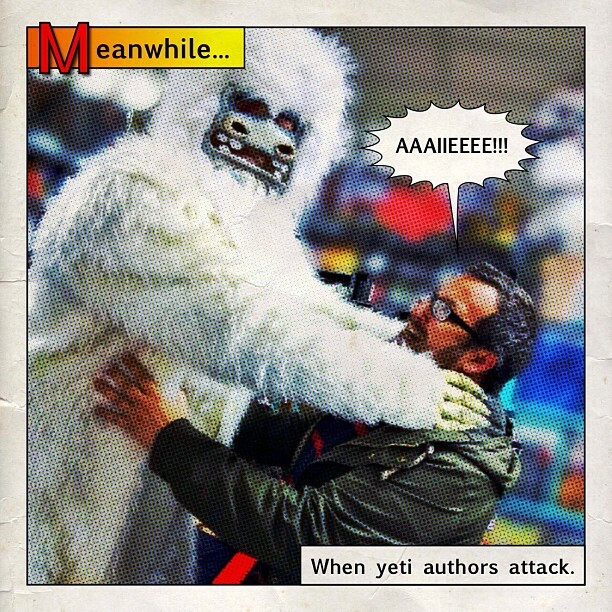 This one taken by the lovely @deadlyknitshade and featuring the yeti-tastic @gnorthfield is one of the best. Thank you to everyone who came, The Bookseller Crow for having us, and of course to @Talljamesnixon for spinning the gramophone wheels of ancient pop. So now then, onto the Yeti Poo Biscuits, which I think were a hit, as they vanished without a trace. They are super easy to make, the only complicated bit is squirting them with a piping bag (but that’s easy after the third try – and ace fun with kids.) It’s basically a doctored version of this Viennese Whirl Recipe by the Hairy Bikers, and makes about 15/20 biscuits. Very simply, put all the ingredients into a mixing bowl (except the chocolate and sprinkles), and mix it all thoroughly. I used an electric mixer thingy, as it can be quite firm otherwise. Then tip it into a piping bag (using a circular nozzle), and for each biscuit squirt it onto a greased baking tray in one spiral motion (from outside to in) allowing the final tip to rise into the air like a real poo. I aimed to make the biscuits about 4cm in width, but you can make them as big or little as you like. Heat the oven to Gas Mark 5, and cook the little poos for about 13 mins in the middle of the oven. Keep an eye on them, as the tips may burn if you’re not careful. They should brown very lightly at the edges. Once they’re done, let them cool, and while that’s happening melt your chocolate bar in a bowl over a pot of hot water. Oil up a piece of greaseproof paper, and once the chocolate’s melted, dollop half a teaspoon full per biscuit onto the paper, placing the biscuit firmly (but gently) on top. I like to turn the biscuit to ensure the chocolate fully covers the base. If you want to be fancy, and have left over chocolate, you can drip some all over your biscuits and them sprinkle with Weetabix dust for a truly authentic poo look. Once that’s done, stick them in a fridge for an hour to set the chocolate, and you’re done! The Way of the Yeti Poo Biscuits is now with you. Thanks @jabberworks for this pic!